STRAZORS.com - all about classic razors - John & William Ragg, Sheffield. The company was founded in 1831 by John Ragg and William Ragg in Johnson Street. However, knife maker Richard Ragg was said to have been a distant ancestor working in Ecclesfield in 1601. The firm was listed in 1833 as John & William Ragg, razor, scissor, and pen knife manufacturer, Johnson Street (off Nursery Street in the Wicker and near the River Don). 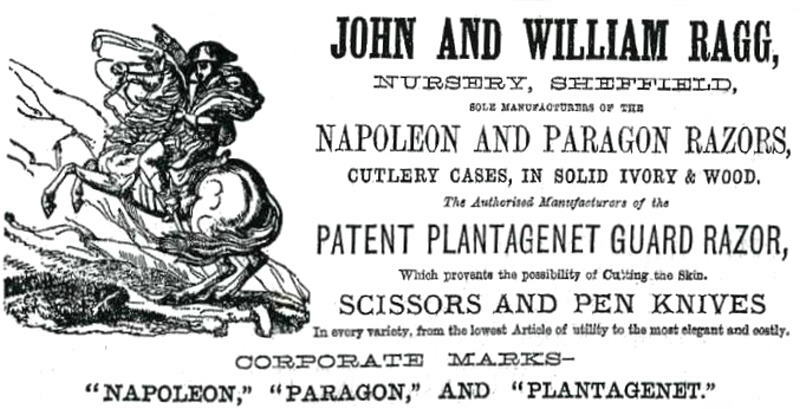 In 1839, it started advertising in Sheffield trade directories, utolizing its striking trademark - Napoleon on a rearing horse - combined with the words, "Napoleon", "Paragon", and "Plantaganet". John Ragg died on 7 December 1851, aged 49. William Gould Ragg, the other partner, played a part in town affairs, serving as an Overseer of the Poor and chairman of the Highway Board. He died on 11 October 1865, aged about 56, at his residence in Broomhill. By the late 1860s, the partners at Ragg's included James Crawshaw Ragg and William Ragg (the former died on 2 July 1887, aged 72. Throughout the 19th century, the firm operated from its Nursery Street premises, specializing in the razors and scissors. However, it also made "pen knives in every variety". The senior partner in the late 19th century was William Ragg, Broomgrove Road, who died on 5 June 1907, aged 70. After 1907, the firm was located at Nursery Works, Eldon Street, and broadened its products to include other types of knives. 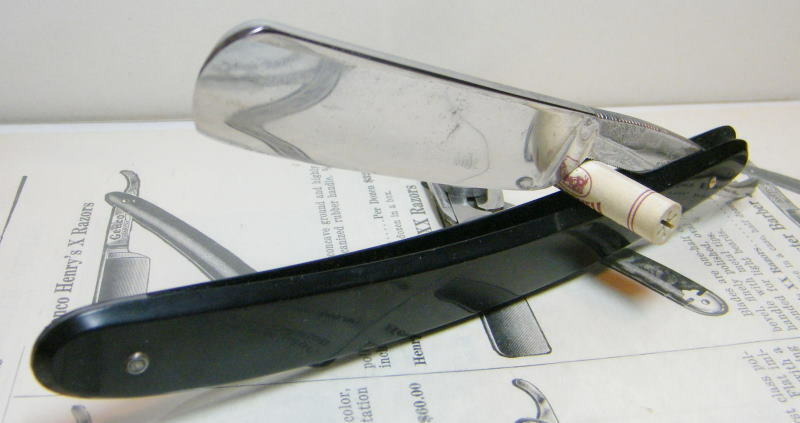 In the 1920s, the firm produced safety razors under the trade name 'ROTAX", using their own machinery. Eventually, faster German machines were installed, capable of producing about 15,000 blades a day. Ragg's also manufactured tuning forks. In 1956 Ragg's moved to Nursery Works, Little London Road, and Norton Hammer, Sheffield. The managers were William Ragg, who had joined in 1896, and his son William Gordon Marriot Ragg. The former died on 7 August 1965, aged 84. In 2010, the firm (after its takeover of William Grant) continues to make professional knives, palette knives, and surgical scalpels as Granton Ragg Ltd, Parkway.